I n November, events in San Miguel de Allende focus first on death, then on art & craft, jazz, and patriotism. The month begins with one of my favorite Mexican holidays, Día de los Muertos, Day of the Dead. Study it closely, and this holiday will help you understand something of the Mexican character. This is not a heavily touristed time of year—maybe the best reason to visit now—and sanmiguelenses enjoy having their town back. After May, it's the next lowest-key time of year. Still, there will be playreadings and lectures and gallery openings to check out. Find the details of these one-time November events in San Miguel de Allende on our Current Activites page (coming soon). November 1 - All Saints' Day. This is the day when every saint ever named is honored. It's also the day to honor the souls of dead children. Listen for firecrackers going off throughout the night to lure the little ones home. 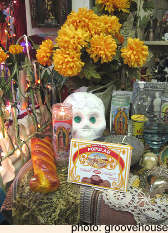 November 2 - Día de los Muertos, Day of the Dead. Ofrendas, or memorial altars for the dead, are built in homes, in public buildings, in the parks and cemetaries. These range from a simple table-top affair with a candle and a small bouquet of flowers to a huge elaborate display that can take hours to assemble. My first year in Mexico, I built a simple ofrenda for my father. Besides his picture, I included his camera, a pack of his favorite cigarettes, his Swiss army knife. I was amazed at the emotional power such a simple act had for me, a non-Catholic. Some fine public altars can be seen at the Biblioteca patio, the Allende House museum, and the radio station patio on Calle Recreo. Click here for a more complete look at Day of the Dead in San Miguel de Allende and even a recipe for the holiday's famous Pan de Muerto, or Bread of the Dead. Note: If you plan to go to the cemetery tonight—and I recommend you do—be aware that the line to get in the gate may be several hours long. Mid-November - Feria Nacional de la Lana y Latón (National Wool & Brass Fair). This artisans' market has been going on as a regular November event in San Miguel de Allende for many years. It is now held in the Plaza Cívica, usually running for about ten days. Most of the vendors offer nothing you can't find the rest of the year, but you can often pick up very good examples of wool rugs from Oaxaca at decent prices. Late November (U.S. Thanksgiving Weekend) - The International Jazz and Blues Festival. This great four-day celebration of music has been around since 1995. In addition to the regular concerts at the Angela Peralta Theatre, there are jam sessions in many clubs around town and spontaneous sessions in the park and elsewhere. Here's a closer look at the San Miguel International Jazz and Blues Festival. November 20 Día de la Revolución (Revolution Day). This marks the beginining of the Mexican Revolution in 1910, which led to a bloody ten years of fighting and made international figures of Pancho Villa and Emiliano Zapata. Be on the watch for a parade and other civic events. The actual legal holiday may fall on the nearest Monday or Friday, making a three-day weekend. Ask locally for details. November 22 - Musicians' Day - It's actually the feast day of Santa Cecilia, but since she's the patron saint of musicians, music makers of every kind gather tonight at midnight in front of the Oratorio church and offer up an all-night serenade to the Virgin. November is a quiet, pleasant time in San Miguel, usually with perfect weather, less traffic, fewer tourists crowding the benches in the Jardín, but still not boring. San Miguel can never be boring. And the November events in San Miguel de Allende are enough to get you out for a glimpse of the Mexican soul.